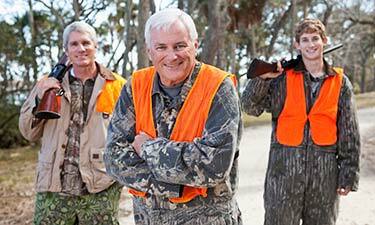 Register a firearm once on behalf of multiple users with a Gun Trust. 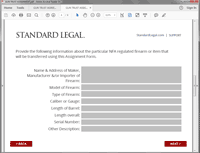 When an individual registers a firearm with the ATF under the National Firearms Act, by law only the registered user may own, transport or fire that weapon or accessory. 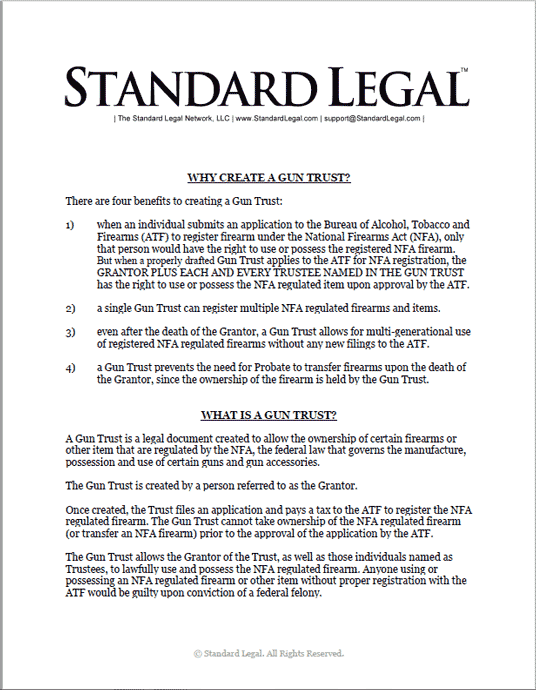 But when an application from a properly drafted Gun Trust is approved, the Gun Trust GRANTOR plus EACH AND EVERY TRUSTEE NAMED has the right to use or possess that firearm. Also: multiple firearms can be registered to a single Gun Trust; a Gun Trust allows for multi-generational use without any new document filings; and a Gun Trust prevents the need for Probate upon the death of the Grantor. Limit ATF paperwork and filing fees. Easily pass firearms on to friends or family members after death. Set up a Gun Trust today! A Gun Trust is a legal document created to allow the ownership of certain firearms or other items that are regulated by the National Firearms Act (NFA), the federal law that governs the manufacture, possession and use of certain guns and gun accessories. 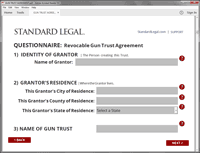 A Gun Trust is created by a person referred to as the Grantor. 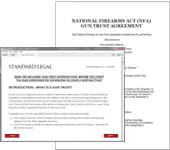 Once created, the Trust files an application and pays a tax to the ATF to register the NFA regulated firearm. 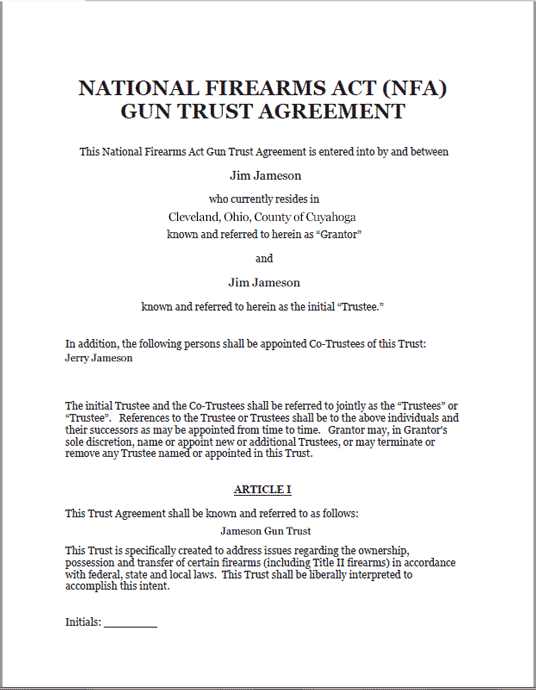 The Gun Trust cannot take ownership of the NFA regulated firearm (or transfer an NFA firearm) prior to the approval of the application by the ATF. 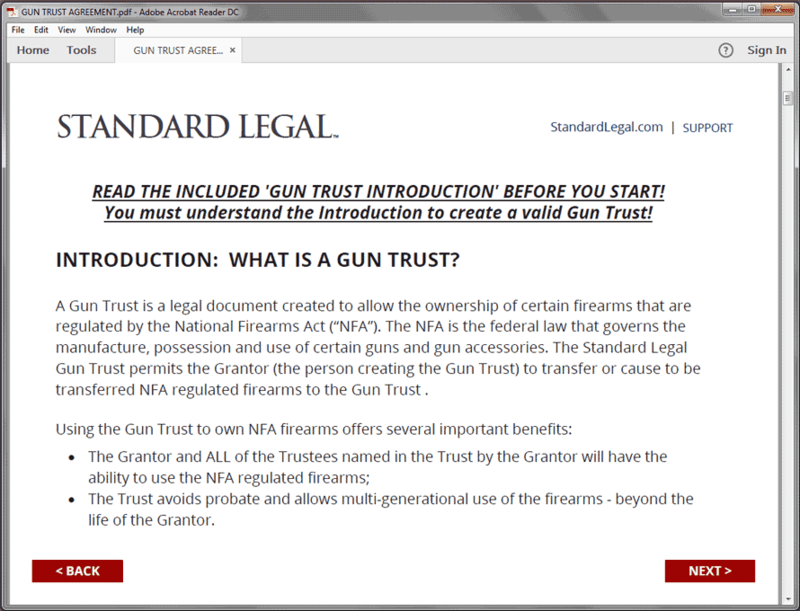 The Gun Trust allows the Grantor of the Trust, as well as those individuals named as Trustees, to lawfully use and possess the NFA regulated firearm. Anyone using or possessing an NFA regulated firearm or other item without proper registration with the ATF could be guilty upon conviction of a federal felony. Naming several Trustees within a Gun Trust allows different people to use, possess, store and transport NFA-regulated firearms. 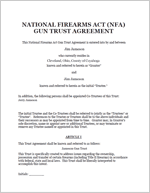 By simply adding an eligible person as a Co-Trustee, the owner of the NFA weapon can authorize these persons to legally use any NFA weapons that the Gun Trust owns. Also, a properly executed Gun Trust will avoid Probate, and while alive the Grantor can direct how the weapons will be held or distributed. So even non-regulated weapons can be added to a Gun Trust, to make them accessible to family and friends even after death. 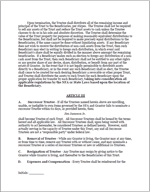 The Gun Trust is revocable and can be amended at any time during the Grantor's life. 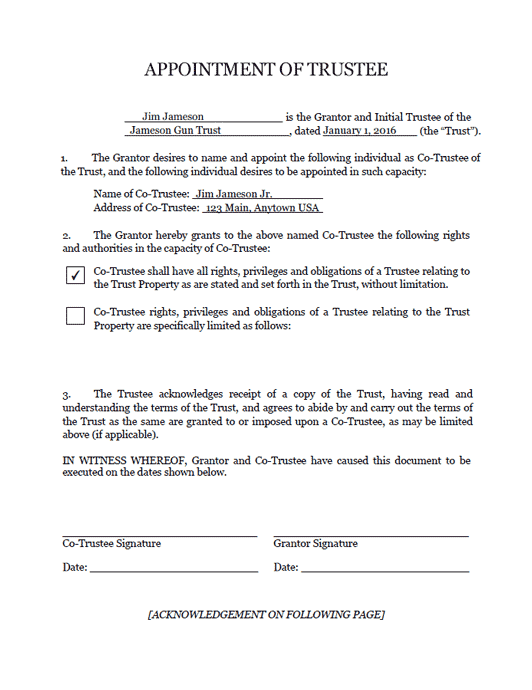 The Grantor can change beneficiaries, assign new weapons to the Trust, sell or transfer any weapons held in the Trust, etc. Minor children can be named as Beneficiaries of NFA Gun Trust property but cannot legally possess any NFA regulated item until they are at least 18 years old and/or be able to lawfully to possess a firearm under state and federal law. 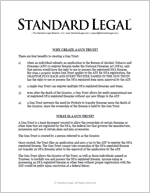 The Standard Legal Gun Trust does not use a "Schedule" to list all Trust property. 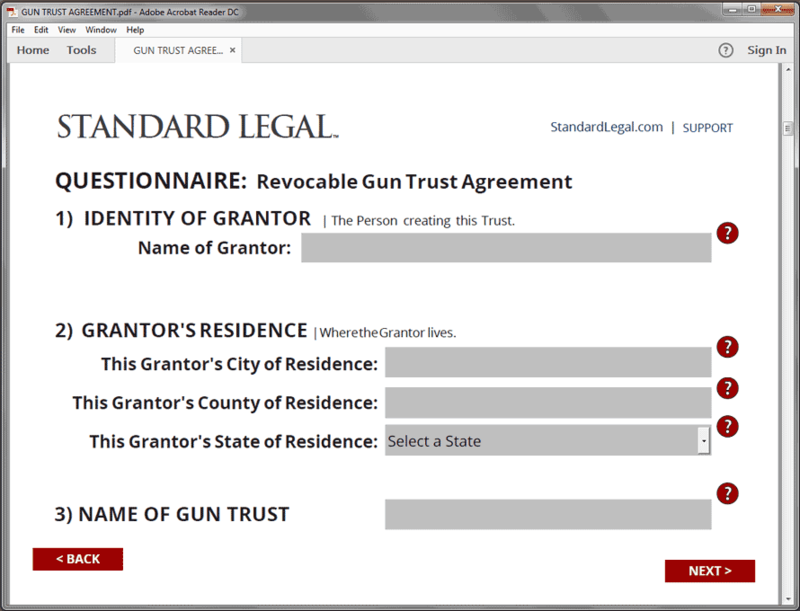 Rather, the Grantor will transfer NFA regulated items to the Gun Trust using a separate Assignment Form. This Assignment Form cannot be used until the AFT has approved the registration and issued the Tax stamp. 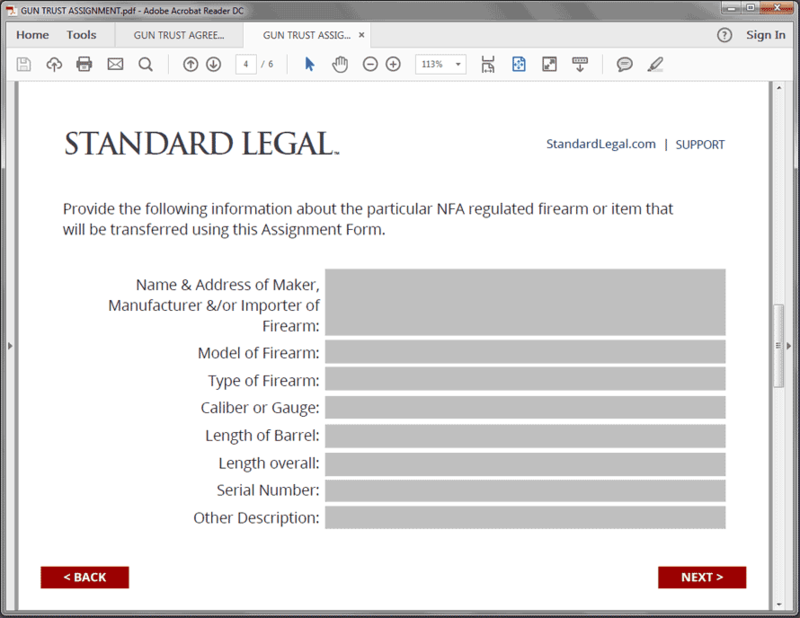 The Assignment Form is NOT part of the Gun Trust; it merely offers proof of transfer to the NFA Trust. 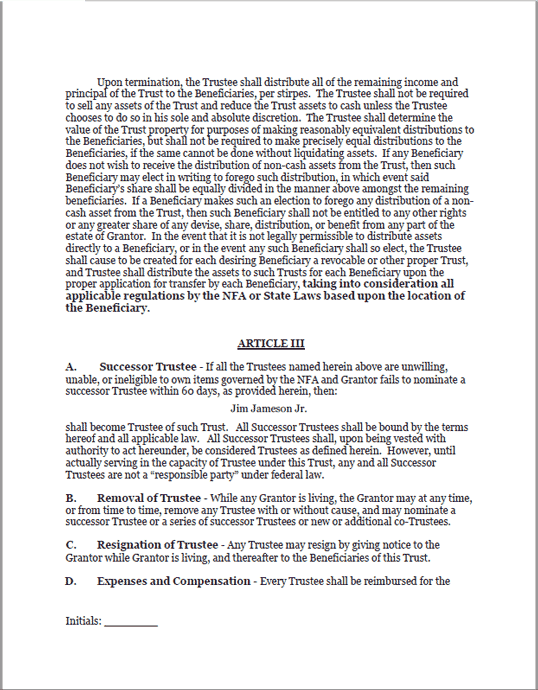 By eliminating the schedule of firearm ownership from the Trust itself, the Grantor and Trustee are not required to provide a list of all firearms owned by Trust when making later application for new NFA regulated items. 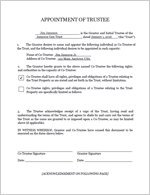 When the Grantor dies, the Trust continues to own the property that has been assigned to the Trust. Naturally, those named as Trustees can continue to possess and use the NFA regulated firearms owned by the Trust. WHAT FIREARMS AND ACCESSORIES ARE REGULATED BY THE ATF NFA? Additional information regarding NFA regulated firearms is available from the ATF. Remember, non-regulated weapons are also eligible to be transferred into a Gun Trust for joint Trustee ownership, transportation, and use. 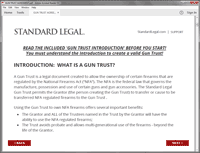 The Standard Legal Gun Trust is valid in all 50 states: the document complies with all federal law and regulation pertaining to NFA Gun Trusts. NOTE however that some states and metropolitan areas will have specific restrictions on NFA items that can be owned or possess by the Gun Trust or Trustees, so make sure that you review and follow all state and local laws and regulations. Gun Trusts are private documents, but must be submitted to the ATF with the appropriate application for registration. Further, some states require that Gun Trusts be registered in the county in which the NFA regulated firearms are possessed. These states include Alaska, Colorado, Hawaii, Idaho, Michigan, Missouri, and North Dakota. Some states have optional filing requirements, including Florida, Maine and Nebraska. States in which Notary Requires Witness: Alabama, California, Delaware, Florida, New York and Louisiana.